Some people look forward to the arrival of St. Nick; I myself eagerly await the opening of cherry season. Memorial weekend marks the opening of the U-Picks in Brentwood. People come from all over the Bay Area to pick the much sought after fruit. I was lucky enough to head out Saturday morning before the crowds started arriving. The sun was shining amongst the clouds. I grabbed a bucket and headed into the acres of cherries just waiting for me. I made sure and strolled up and down the rows looking for some beauties. They were all around me each one prettier than the other. How can one choose in such situations? We've had a lot of rain so I was worried about the quality of fruit; have no fear I sampled plenty (quality control purposes). I bought plenty too; 17 pounds ought to hold me over for a week or so. 1) Bring shoes that you don't mind getting dirty and scraping the mud off of, these are farms after all. 2) Bring the kids, especially if you live in the city and they don't have the chance to go pick their own fruit. You would be amazed at how much better they think it tastes when they have picked it themselves. 3) Go online to http://harvest4you.com/ and get a map of all the u-picks and farm stands in the area. 4) Some of the farms have picnic areas where you can eat your bounty or there are a few restaurants if you head downtown. 5) You don't need any special equipment, just your sense of adventure. My daughter helped me wash and sort them all. She thought they were so pretty she grabbed my camera and got this shot for you. I love it; all the training is paying off. Can you believe that first 17 pounds was gone by the end of the weekend? I went to a Brunch at Lemons and Anchovies Headquarters with fellow Bay Area Bloggers, it was a wonderful way to spend the day and I brought a tart to the brunch I will share with you shortly. Great food and great company, I can't think of a better way to spend the day. I usually plan two or three trips to get all the cherries I want. I have a special guest (Robbyn) arriving in Mid July and per her request I have prepared a couple of jars of Brandied Cherries. They were something my Grandpa always made and had on hand. They are perfect for having on hand when you want to drop one in a Manhattan; I pitted mine so they can be ladled over ice cream. In a small saucepan combine Brandy and sugar, turn heat on to medium and cook until sugar is melted. No need to bring to a boil, take off the heat and set aside. Sterilize two 1 quart Mason jars and fill with pitted cherries. Insert strip of lemon zest in each jar and cover with Brandy mixture. Put lid on tightly and store in a dark place for 6 weeks. I received a really great question from Angela - Recipes from my Mom; she wanted to know what cherry pitter I like. I don't usually specify equipment, but in general I prefer simplicity. I have an OXO handheld one, I've had it a couple of years and it's still going strong. I bought mine at a local home goods store but I have seen their products almost everywhere. Ohhh wow Gina, 2.50 for a pound? woww what a great price, and nothing better than picking it yourself 1st class!!! Wonderful! Your Brandied Cherries sound amazing!!!! I would love to go to a U-Pick farm. 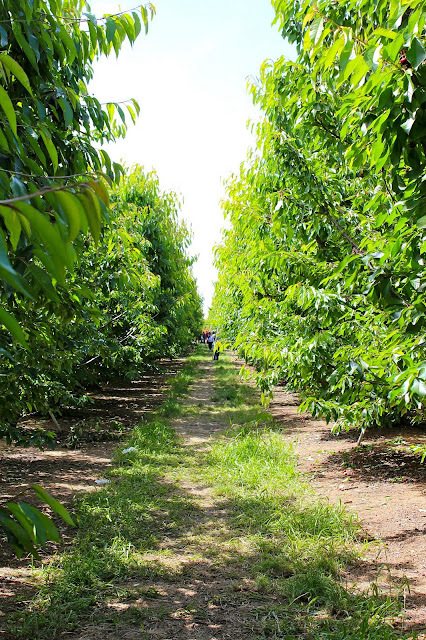 Everything tastes better fresh off the tree or from the ground. I guess I will have to settle for making these cherries with ones from Costco. I'm so jealous of your cherry-picking experience! Sounds like so much fun and your pictures are beautiful. The cherries are so gorgeous! The recipe sounds great too :) Beautiful post, Gina! How cool! So far I have only picked the strawberries...they must have tasted so GOOD! *Squeal! * :D This boozy cherry recipe sounds right my my alley, I feel like I have been wanting to eat nothing BUT cherries lately! I am jealous you have the U-picks so near you, lucky gal! Looks great! I've just baught some cherries yesterday, they're cheaper than before. I still don't know what i'm going to make with them, but what's sure is that they're delicious!! Plain or in a desert, and also as you prepared them! Fruits always are so plentiful in California-I envy you. Making brandied cherries is an excellent and unique idea. Thanks for sharing, glad you enjoyed the u-pick adventure. I love boozy fruit, so this would be right up my alley, Gina!! Sigh...I miss the Bay Area. Hoping to attend Foodbuzz Fest this year, so maybe we'll get to meet up!! So fun! I've never been cherry picking. Apples, blueberries - never cherries! It's cherry season in Israel and I am loving it. I made maraschino cherries recently, which is similar to the brandied cherries. And I just found my first sour cherries and have a pie planned. Next round I'll have to make these, they look awesome. Tell your daughter I love that shot of the three washed cherries. What's your favorite cherry pitter? When you have that many pounds to pit, you must have a great gadget. Cherry season is highly anticipated in my house as well :) I wish there was a place closer where I could pick my own! WOW! That is some gorgeous looking cherries. The color is just so vibrant! Can't wait until fruit is in season in the midwest! Love to go picking! I go crazy for cherries! :) I just bought the "first of the season" cherries and paid 6 bucks/pound... can't wait till the farmer's market starts selling them...they will be way cheaper! Beautiful pictures today. I absolutely love cherries. Michigan cherries will be ready in about a month and you have inspired me to pick some fresh this year. I am enjoying - can your daughter come take photos for me? What a flavor-filled way to keep cherry season going. My aunt had a cherry tree in her backyard (in NYC). Alas and alack, all the cherries in MN are brought in. Brandied cherries! Those look so yummy :) Can't wait to see the cherry tart too! I'm a huge cherry fan, but don't think this is cherry growing country. I've never seen them, which is a bummer. 17 pounds though....my system would be in revolt, if you know what I mean. Your cherry photos are gorgeous! I'm so jealous you get to go cherry picking in your area...cherry trees don't even grow in mine. LOL, too hot! You're causing me foodie heartbreak with this post, Gina. I'm going to have to write about something you can't get in your area ;-). Put up the chocolate and cherry tart! DOOO IT! roomie went crazy over the slice I brought home. Also, thanks for the cherries ;) I may have eaten them all in one sitting. 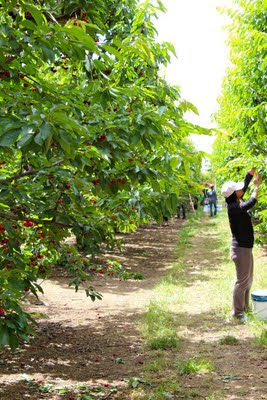 Cherry picking is so much fun, and the brandied cherries sound amazing! The brandies cherries look amazing! 17 lbs. is a good start, for now :) I too always look forward to cherry season, I'm getting anxious here. The upick farm sounds like a lot of fun and can't beat the price. Your Brandied Cherries are going to go perfectly with ice cream. I'd also love them on top of Greek yogurt, yum! Gina, these cherries (and the brandied cherries) are one of the prettiest things to me! I picked cherries every summer at my grandma's...she had the most plentiful trees and would send us home with bags full! Love them still!!! I sure wish I was there with you on that excursion! There is nothing like fresh fruit right off the tree or vine (especially cherries)!!! Mine turned out SO boozy - I was expecting sweeter, I guess. Do you think I could remove the juice at this point, 6 weeks in, and add more sugar, dissolve and re-cover the cherries with it? Hi Jenna, Sorry they weren't what you were expecting. They are brandied, so that is the predominate flavor. I have never tried what you are suggesting. Wish I could be more helpful with regard to that. When I want the flavor to be just sweet cherries, I usually make them into jam and preserve them that way, you could always add a few ounces of brandied to the jam and you will still have the brandy flavor that way.